Coach Mike Cupples has been searching for a stretch of games where his team could play with consistency. Everything has finally fallen into place, and the team seems to be finding its rhythm. The Grand Rapids Community College baseball team went 4-2 in its games Thursday through Saturday against Muskegon Community College, Macomb Community College, and St. Clair County Community College. 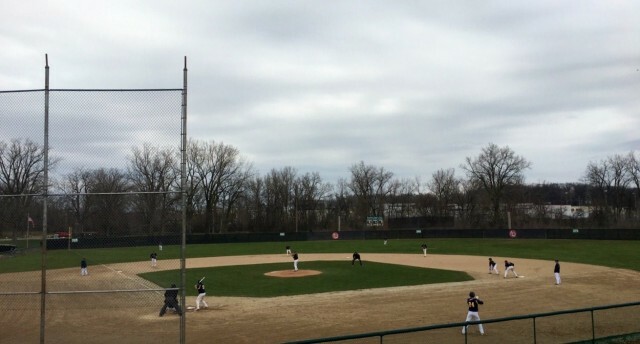 On Thursday, the Raiders won the first game against Muskegon CC 3-0 behind solid pitching, before winning the second game 19-7. In Game 1, Sam Traver (2-2) threw a complete game shutout, allowing just two hits with 11 strikeouts. “All I tried to do was hit my spots and throw strikes tonight,” Traver said. “I knew if they put the ball in play our defense would make the play. Brendan Johnson had a nice day at the plate going 1 for 3 with a homerun and two runs batted in and scored a run. Dalton Phillips went 2 for 3 while scoring two runs. Will Harris and Sterling Brinker also had a solid game at the plate going 2 for 3. In Game 2, Trevor Russo got the win (1-3) going 4.2 innings allowing five runs off eight hits and three walks. Jackson Shaver finished the game pitching 2.1 innings allowing three runs on three hits and a walk. When it came to hitting for the Raiders, Jalen Cox had a perfect day at the plate going 2 for 2 with three walks, while driving in four runs and scoring two of his own. The lead off hitter Matt Milbourne also had a big game going 3 for 5 while driving in two and scoring four runs. Brendan Johnson went 3 for 4 with two RBIs and hit another homerun for the second game in a row. On Friday the Raiders won the first game against Macomb CC 7-6 putting them on a three game win streak before losing 4-6 in the second game. For pitching in Game 1, Shane Odzark started the game and went five innings allowing just two runs, neither of which were earned. He allowed seven hits and struckout three with just one walk. Ean Walda (1-2) got the win throwing a scoreless 1.2 innings to close the game. On offense the Raiders put together a solid game. Harris went 3 for 4 with an RBI and two runs scored. Brinker drove in three of GRCC’s seven runs on his only hit in three attempts. In Game 2 on Friday, Brad Buurstra (0-4) took the loss for the Raiders on five innings of work, giving up five runs, only four were earned, on seven hits and three walks. Milbourne put together a perfect game of hitting, going 3 for 3 and scored two runs. Harris also had a solid game going 1 for 3 with two RBIs and a run scored. The Raiders would split another doubleheader on Saturday against St. Clair, losing the first game 4-7 before rebounding in the second game with a 4-1 win. In Game 1 on Saturday, Justin Palmbos (2-3) gave a great effort but took the loss going 7.2 innings allowing seven runs, but only three were earned. Palmbos struck out 10 and walked just two. The bats were somewhat quiet for the Raiders on Saturday in both games. Harris went 1 for 3 with an RBI. Designated hitter Buurstra went 1 for 2 with a walk and run scored. In Game 2, to close out the weekend, Walda (2-2) got the win on an outstanding performance, allowing just one unearned run in seven innings on just two hits with five strikeouts. Dalton Phillips had a big game at the plate going 2 for 4 and driving in two runs that proved to be the difference in the game. The Raiders seem to be coming together more as a team and it’s leading to less errors and better play all around. “We are playing with more consistency and that is key,” Cupples said of his team’s play lately. “We are getting more wins and the guys feel really good about it. The Raiders’ next game will be a doubleheader at 2 p.m. on Tuesday, April 19 at Kalamazoo Valley Community College.